I call this Cilantro Sour Cream, but my kids have dubbed it “green cream.” No matter how you refer to it, this flavorful sour cream is a great topper for turkey tacos, chili, veggie burgers, or fish. Add all ingredients to a food processor, and process until the cilantro and scallions are well-incorporated. 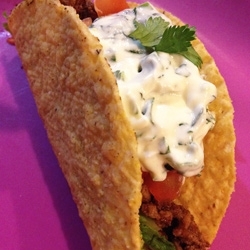 Note: You can use nonfat plain Greek yogurt in place of the sour cream for an equally tangy and delicious topper.